First it was a few Instagram pictures I saw on Sunday afternoon that got me worried. Then the reviews were published. Predominantly sitting on the fence, descriptively un-illustrative in painting a picture of a collection unravelling. I sensed trouble. 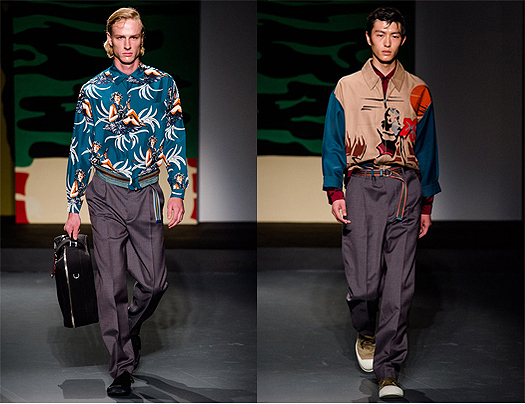 On Monday evening I got the courage to log onto Style.com to see the pictures, my suspicions loaded into reality in front of me: the latest Prada a/w 2014 menswear collection was less than lacklustre and nothing to lust for. Cliché perhaps, but I’m happy to admit that I am, and always has been, a big fan of Prada. There are only a handful of designers who consistently manage to impress me with interesting design, intriguing aesthetics and innovation that instigates new fashions. In charge of the brand, Miuccia Prada seems to be the answer to Diana Vreeland’s fashion mantra, giving us what we never knew we wanted. 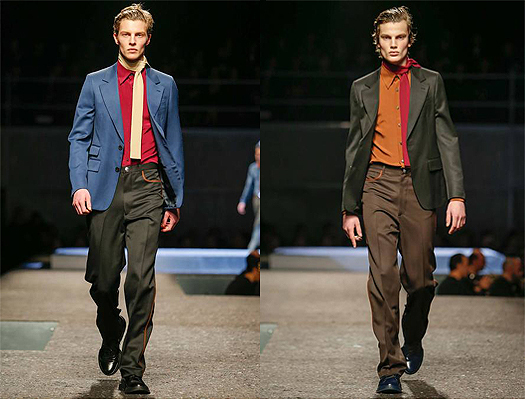 The reason Prada works is that it’s never intellectually challenging but subversive and suggestive. The product is always familiar enough for us to recognise and relate to but treated in a way that makes it appear special, even unexpected. Good and bad taste are equally present in Miuccia Prada’s work, just think of those a/w 2013 basic brogues with tractor like tire-soles or the patchwork pop art fur coats done for women’s s/s 2014 collection. 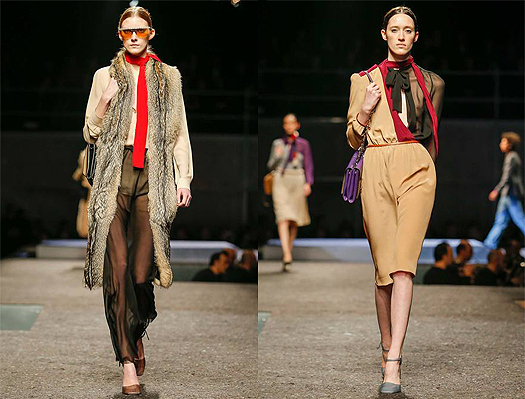 A quick review of resent runways reminds us of Prada at its best. 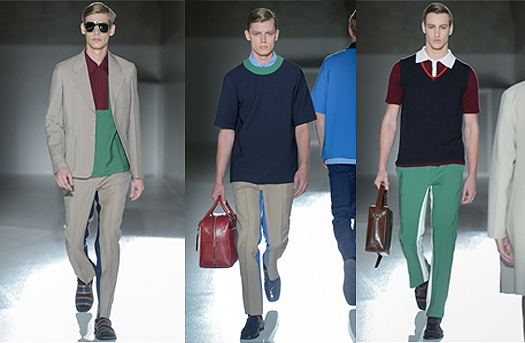 There was the s/s 2013 collection with sporty detailing, minimal cutting and quietly exiting colour palette. The following season, a retro-referenced collections with subtle 60’s reference points and a touch of twee, counterbalanced this. S/s 2014 collections continued with the nostalgic aesthetics blending 40’s and a touch of Montgomery Clift’s, From Here to Eternity (1953). 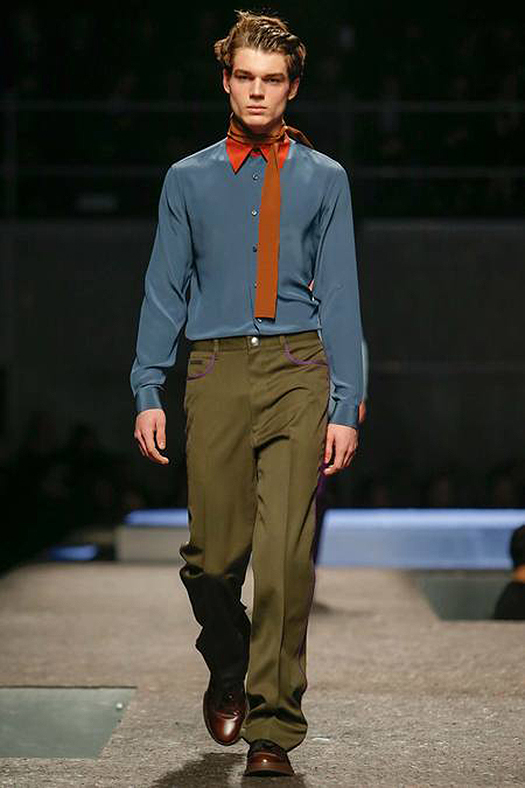 [ref]I have particularly been dribbling over some of the patterned shirt with cuff detailing from the s/s 14 collection at my local Prada store to the point that the staff are getting nervous when they see me entering the store. 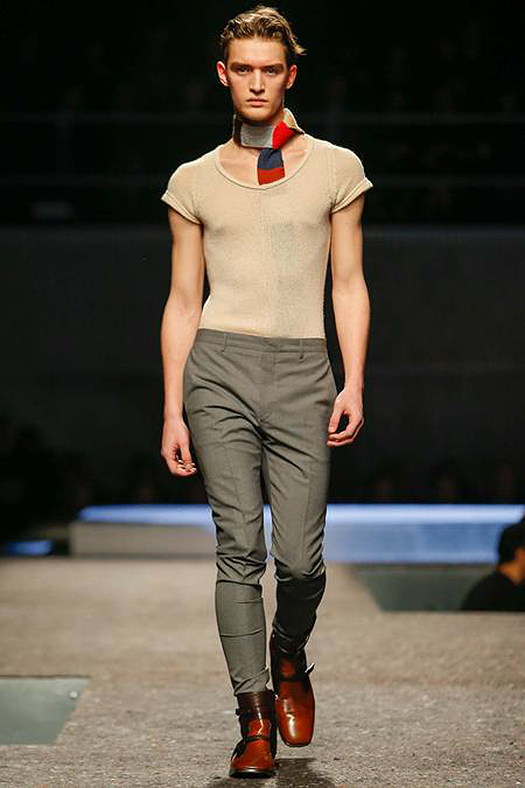 [/ref] All this, proof that Prada can. Whilst arresting in terms of colour and commercial in its potential appeal to the conservative menswear market, the a/w 2014 collection as a whole looks uninspiring. Flicking through the collection, there were none of those spontaneous Uuh’s, Ahhhh’s and Ooh’s gasps that suggest something special. Instead it was all silence with the acceptance that it was just too normal for Prada standards with nothing noteworthy, nothing new. It didn’t help that the women’s pre-fall collection presented alongside, looked more motivating against all this. 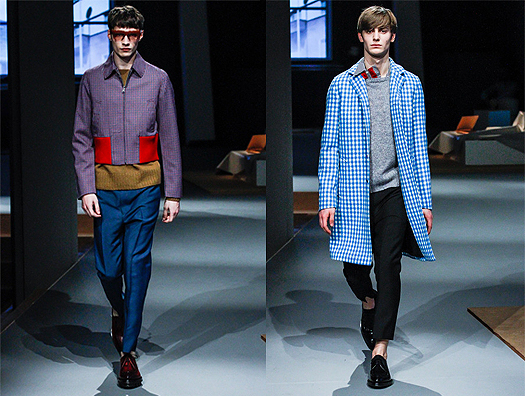 Miucca Prada has trained us to expect the unexpected, the magical and the attention worthy. Despite her ability to change the course of fashion, there was no real sense of evolution here as the silhouette seems stale and muted colour world, though the best part of the collection, seemed undeveloped from previous two seasons. Then again, it can’t always be perfect. From a season of low, the expectation is that next season, it can only go upwards again. Hopefully.